Beyond creating the visual and aural qualities of a waterfall, these Waterfall Filter units provide biological water filtration and aeration. The filtration properties of Waterfall Filters’ Bio-Tech mats and media help establish a balanced ecosystem for plants and fish to thrive in. Waterfall Filter units are designed to be easily camouflaged with natural materials and easily accessed for routine maintenance. 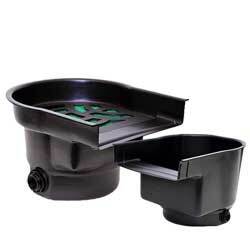 Upflow design, filter pad, and media bag (media not included) provide exceptional biological filtration. 20" x 16" x 14"
19" x 22.5" x 14"
24" x 30" x 20"